“Buy low, sell high” is an old adage of investors. However it is difficult to know exactly when market highs and lows arrive without the benefit of hindsight. As investors we can look to indicators to assess whether markets appear overpriced or underpriced compared to historical averages. However we really do not have enough information to know exactly when to buy at market lows and sell at market highs. Many investors have tried and failed to time the markets. They would have been better just buying and holding the market as a whole. Dollar Cost Averaging (abbreviated DCA) is a common investment approach that eliminates the risk of buying when the market is overpriced. The technique involves buying a fixed dollar amount of an investment at regularly scheduled intervals. For example, using a DCA approach an investor might purchase $100 of a stock each month. Fluctuations in the price of the stock over time will change the amount of shares the investor purchases each month. But each month he will continue to purchase as many shares as $100 will buy. In months where the stock price increases, he will purchase fewer shares but in months where the price declines he will purchase more shares. Does Dollar Cost Averaging work? DCA does exactly what it is indended to do, which is to ensure that (over a period of time) you pay an average price for a particular investment. You will not pay the highest price, nor the lowest price for that investment, it will be an average. If you purchased $1000 of the stock in either month 1 or 2, your shares would be more valuable in month 4. However, if you had purchased $1000 of the stock in month 3, your shares would be less valuable in month 4. This example shows that DCA ensures you pay an average price for your investments. You pay more than the lowest prices, but less than the highest prices. Investors can choose to take their chances buying investments in larger amounts. In the example, you would have been better off in 2 of the 3 months, but worse off buying in 1 of the 3 months, than the DCA approach. Ultimately the choice to utilize DCA or not comes down to investor preference and risk tolerance. DCA provides certainty and reduced risk. DCA also provides a psychological benefit for investors who struggle with making impulsive investment decisions. As investors, it can be difficult to buy an investment at a given price and watch the investment decline in value. This is because as investors we dislike losing value even more than gaining value. Studies have shown this is why investors will hold onto losing stocks longer than they should in hopes they will recover–psychologically, investors do not like being wrong. The challenge is that even when we make long-term investment plans, short-term market pricing fluctuations can affect our decision making. I believe that DCA can help investors stick with their long-term plans by relieving some of the short-term market-driven noise. Instead of buying a stock at a given price and becoming “anchored” to that price in your mind, DCA provides the benefit at buying at multiple prices over time and provides the certainty that you are not going to pay the highest price. Unless you calculate your true cost basis per share of stock or use your broker’s dashboard to check it each month, you likely won’t even know what your true cost basis per share of stock was. It’s a trick — but it’s an effective trick. 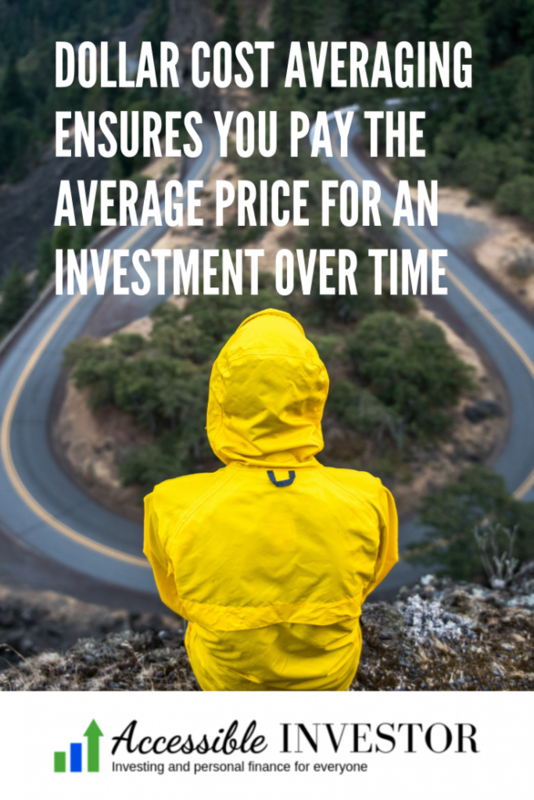 As I mentioned earlier, dollar cost averaging will ensure that you pay the average price for an investment. This means it will not ensure you get the best price. 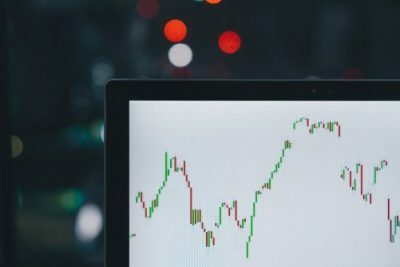 If an investment is consistently increasing in value over a period of time, dollar cost averaging will result in paying more per share (receiving less shares) than in you had fully invested at one time. 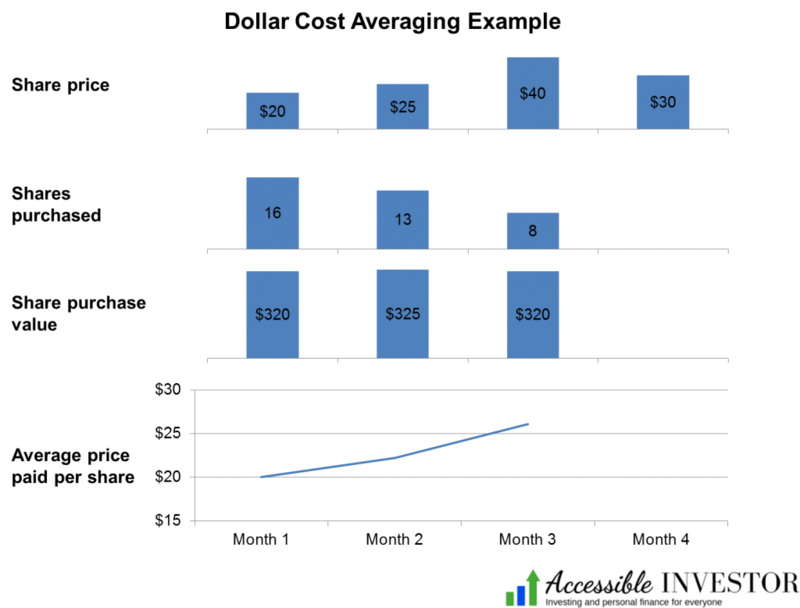 So in this example you would invest $833 every month for 12 months into the investment or portfolio of your choice. 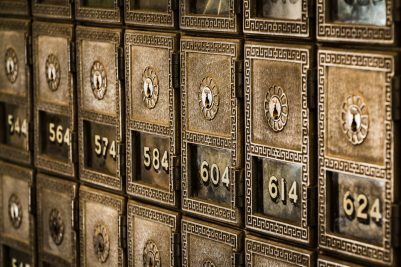 You may or may not be able to buy exactly $833 of your investments each month (depending on share prices and whether or not you are able to buy fractional shares) but you would attempt to buy as close to $833 as possible. In summary, dollar cost averaging can be an effective method for entering an investment position. It ensures you receive the average price for an investment over a period of time (not the lowest or highest). Additionally it can provide a physiological benefit for investors. What are your thoughts on dollar cost averaging? Have you used it before and do you consider it an effective method? The main benefit of DCA is that it’s so simple and it requires so little time to manage. You can even automate it these days! Personally, I only spend a few minutes managing each month. One minute to send the money to my broker, another minute to buy broad market indexes, and then a whole month of not looking at my portfolio :-). Completely agree! It makes investing really simple and easy. Thanks for reading! Really clear explanation, Accessible! I love it. 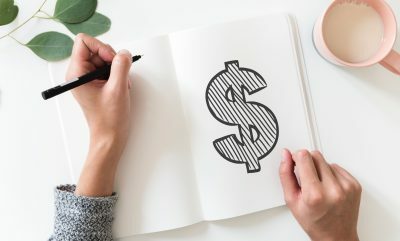 Although most people don’t realize it, any investment made with monthly deductions from your paycheck, such as 401(k) contributions, apply dollar cost averaging in practice! You’re absolutely correct that many people are DCA without even realizing it. Thanks for stopping by!